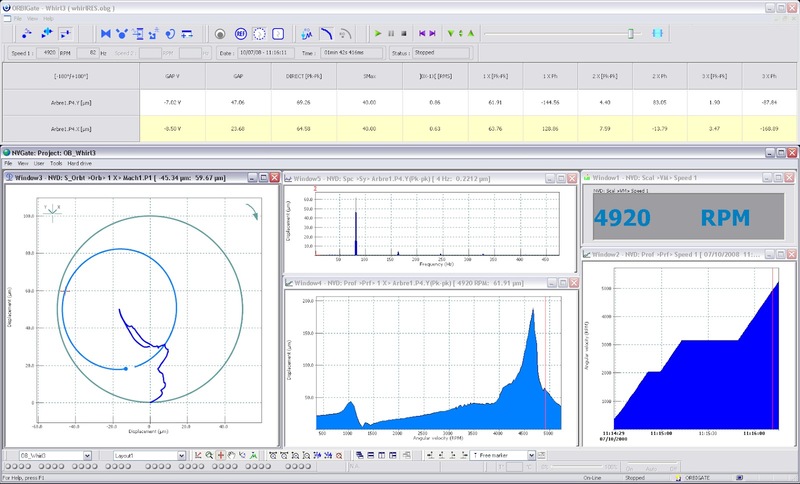 OROS Blog, Measuring Noise and Vibration: ORBIGate, Version 5.0, a new version for the OROS Turbomachinery Vibration Solution! ORBIGate, Version 5.0, a new version for the OROS Turbomachinery Vibration Solution! Starting a data recording whenever one of your 32 channels exceeds a user defined threshold? ORBIGate V5.0 makes it possible! Turbomachinery vibration measurements can be long and vibration troubleshooters don’t always have time to stand behind their instrument to press the record button. In particular during long steady state periods, when waiting for pressure and temperature to stabilize and changing process parameters can increase transient vibrations that are not always expected. That is the right time to start data recording, time signal recording or just increase the data collection sampling rate! ORBIGate does that automatically. Save the ASYNC (FFT) analysis! Synchronous analysis (Order tracking) is of course the base when dealing with rotating machinery. It has one drawback though: it requires a tachometer signal. In the field, it happens that the tachometer signal is not available: that is exactly when it is key to collect the ASYNC (FFT) results. ORBIGate allows now to use the full multi-analysis power of your OROS instrument: collecting both Synchronous data and Asynchronous data let you always be sure to get results whatever tachometer information is available. It is particularly useful when your purpose is to compare several start-ups like hot, warm or cold. It is also very useful during multiplane balancing procedures when comparing trial tests. >> All details are available in the ORBIGate V5.0 release note (available in your myOROS section, OROS customers area, please first be logged in and download the ORBIGate V5.0). >> If you are not an OROS Customer, please contact us.